Singer Annie Lennox has been presented with this year's woman of peace honour at a summit of Nobel Peace Laureates which took place in Berlin. 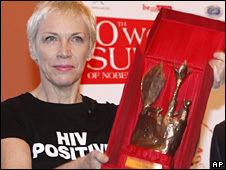 The former Eurythmics star scooped the prestigious prize for her work raising awareness of HIV and Aids. Lennox, 54, has raised $2m (£1.2m) since 2003 with her charitable campaign Sing, which provides South Africans with treatment and testing. "I want to express my profound gratitude and deep humility," she said. "I honour all the women working around the globe to reduce the effects of this pandemics. This is for them, they truly deserve it," added the musician. Lennox said she was inspired to do something after witnessing former South African president Nelson Mandela, describe the HIV pandemic as a "genocide." The star was also presented with a piece of the Berlin Wall.